For my latest product review for the good folks at Kitchenware Direct, I chose an All-Clad 20cm stainless steel frypan. 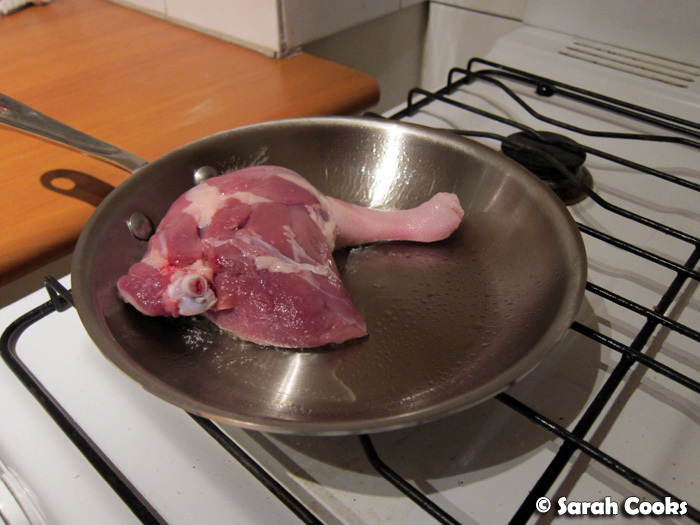 Perhaps a rather boring choice, but I really needed a small metal frypan (i.e. not a non-stick one), and I've always wanted an All-Clad pan! 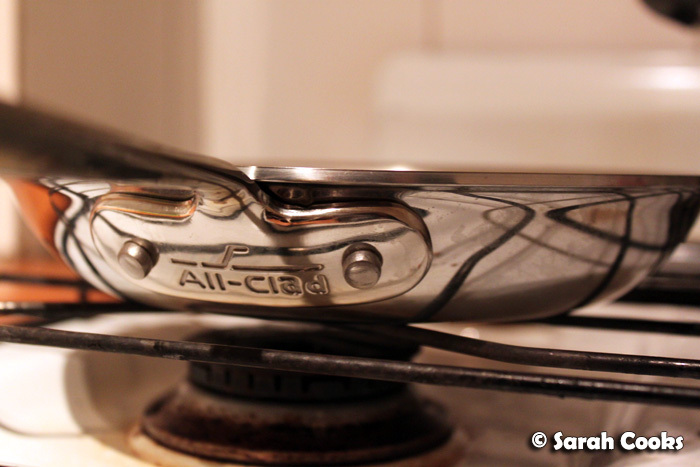 You see, many years ago, I used to work at a cookware store, and I would always drool over the All-Clad range. I loved how shiny they were and I loved their obsessive focus on quality. Each piece comes with a little card with the name of the individual who inspected it - cool, huh? Prior to this one, I didn't actually have a frypan that could go from stovetop to oven, (apart from my carbon steel pan), so I've been testing it out with some tasty stove-to-oven recipes! 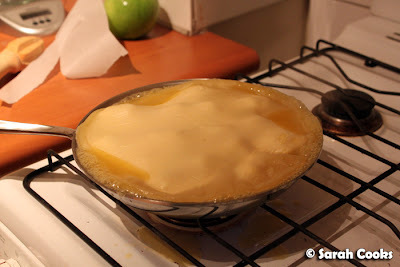 You top it with a sheet of puff pastry, and cook it on a high heat for about 20 minutes until the sugar is caramelised, then finish it off in the oven. But about 5 minutes into the cooking time, the sugar and butter underneath started bubbling over and spilling out of the sides - eek! 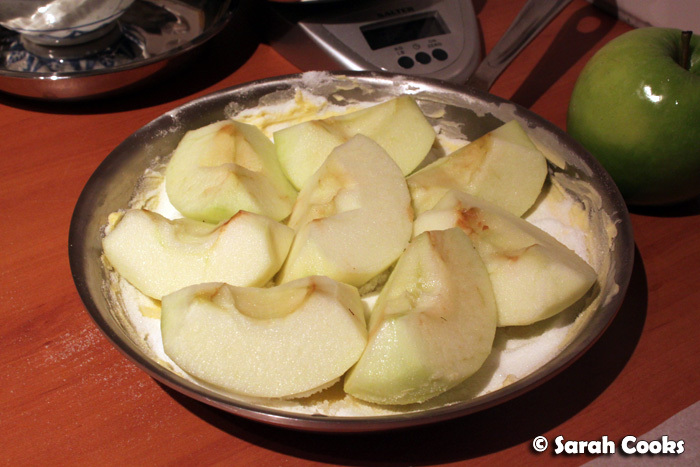 Because of the spillage, I got a bit timid and took the pan off the heat after only 10 minutes, and the apples turned out a bit pale in the end. (It still tasted good though!) I've since read other recipes where you caramelise the apples before adding the pastry lid; I think I'll try this next time. Once it was baked, I managed to flip it over in one piece - phew! 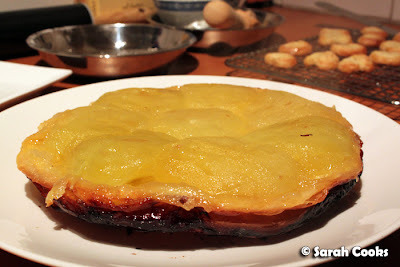 So yes, the tart turned out a little pale, but it was still very tasty, especially with some crème fraîche on the side! (And in the background you can just see some little palmiers I made with the pastry offcuts). 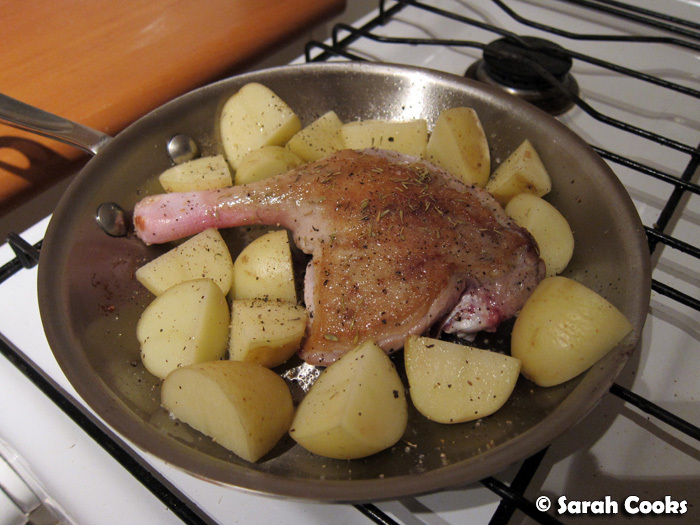 ... then finish it off in the oven with some potatoes and thyme. It's almost too easy for such a decadent, delicious dinner! 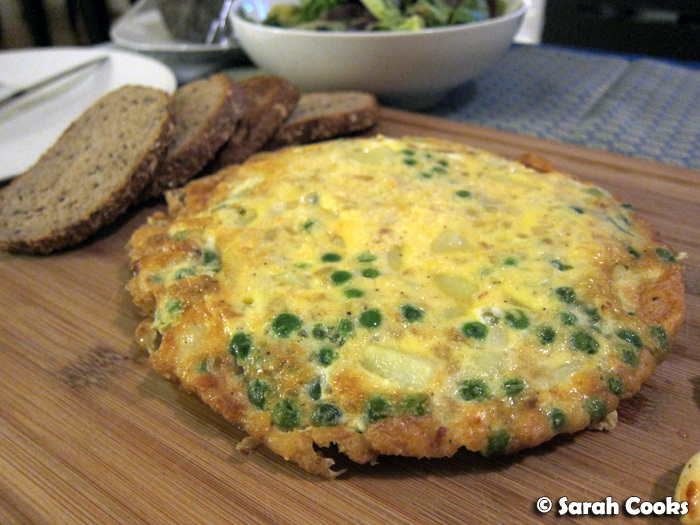 (Don't worry, I had this with a refreshing green salad). 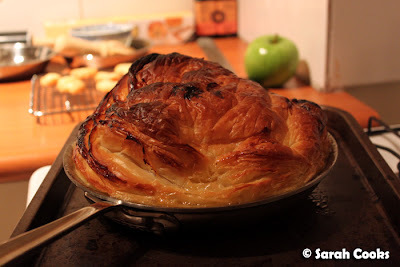 Another Nigella recipe, this time a light supper from Forever Summer. One negative thing I've noticed about this pan is that it can be very difficult to clean, especially if there's cooked-on bits of food. When I made the frittata, it stuck terribly, even though I greased the pan generously. The instructions that come with the pan say that you're not meant to use a metal scourer to clean it, but this was actually the only way I could get it to come clean - soaking, sponges and soft scourers just didn't work. (Although I felt terribly guilty about it - I'm the type of person who always follows the instructions for my cookware, hehe). However, I've found that this pan is absolutely perfect for cooking hot batters - things like Yorkshire pudding, sweet Yorkshire pudding, my puffed apple pancake, or Nigella's Crustless Pizza. 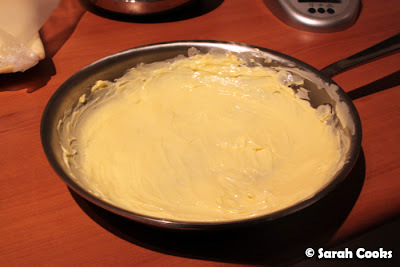 It works way better than the ceramic dish I usually use, as the stainless steel pan conducts the heats more efficiently, which in turn helps the batter rise and get crispy. Mmm... doughy crispy batter goodness. 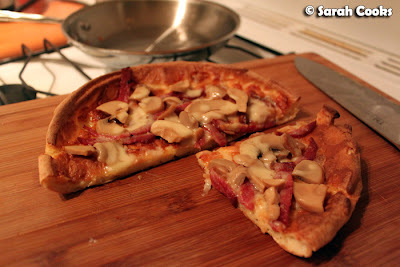 You'll also see that I used trashy tinned champignons like I suggested last time - so tasty. 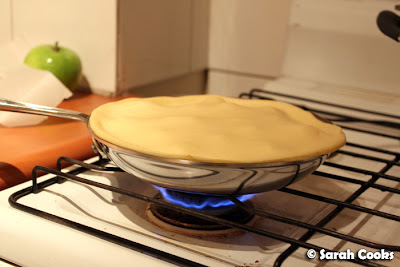 Even though the pan is a bit difficult to clean, it's great for searing meat and cooking my beloved Yorkshire pudding batters - it conducts heat evenly and has a very sturdy construction. 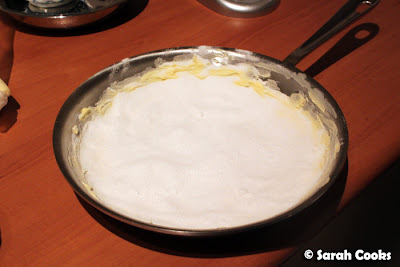 What is your favourite brand of frypan? Can you recommend any other recipes that would work well in this pan? 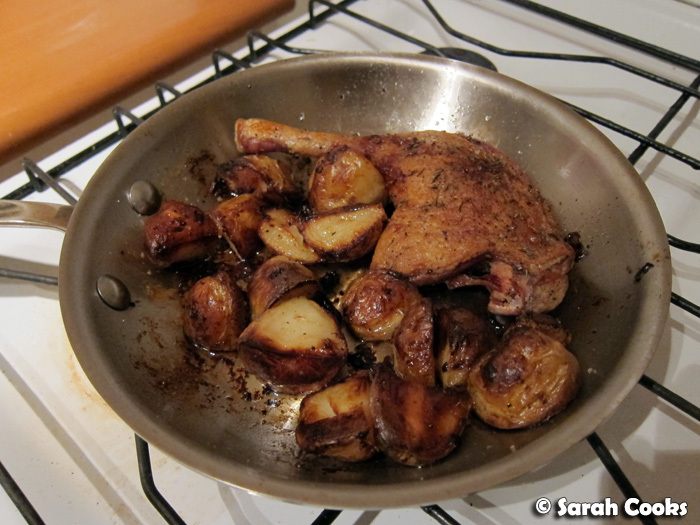 Sarah received the All-Clad 20cm stainless steel frypan courtesy of Kitchenware Direct. 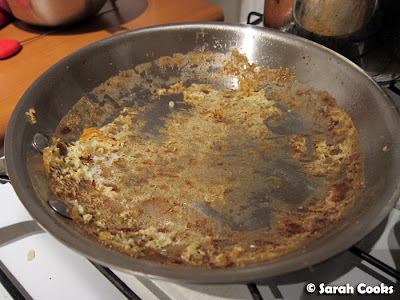 Next time the pan is difficult to clean, just add hot water into it and return it to the stove. Bring the water to the boil, add a little detergent to it, and then turn the heat down to bring the water to a rolling simmer for about 15-20 mins. This should soften all the baked-on food so that it's easier to get off. 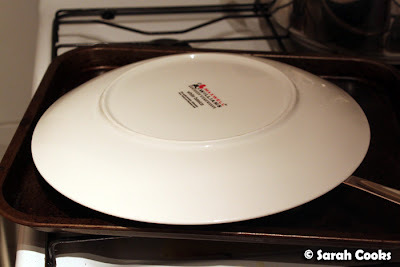 Basically I was telling you my thoughts on new pans! @Anna - Oh boo! How frustrating! Well if you have time and don't mind resubmitting I'd love to hear your thoughts!